Whether you are fishing in the pond, murky water, along the coast, in reefs, or the lake, these top fish finders will help you target fish in prime locations. Fishing electronics are becoming part of every fisher’s arsenal. Many times you feel like you are fishing blind, we all know the frustration that comes with not being able to really see if are fishing in an area where there are lots of fish. Even when fishing at your favorite spot, the weather changes and the fish go into hiding. Sometimes you just can’t see through the water due to weeds or thick cover. A fish finder is all you need to help detect the presence of fish under water and increase your chances of success. Fish finders have been around since the 90s, but as technology advances, you’ll find that these gadgets have been upgraded to carry more features like GPS systems, radar, and electronic compasses. The more advanced ones can even integrate with your VHF marine radio to show other boats or display weather through the NMEA 2000 protocol. Before you buy a fish finder, it’s imperative that you know what to look for in a fish finder. With so many variables involved, the process can quickly become complicated. In this article, we’ll be looking at 6 of the best fish finders on the market today. We’ll also look at some of the questions that users typically ask. Can it help you locate fish? How effective is a portable fish finder? What is a transducer and do all fish finders come with one? What are the different types of transducers? The fish finder is an electronic device used by boatmen (fishermen in this case) to locate fish under the water using sound navigation and radar system (SONAR) technology. Fish finders works by reflecting electronic pulses off fish which then shows that the location of a fish in regard to the position of the boat on the fish finder display. Fish finders also measure the depth and temperature of water, plus they get impulses from underwater features allowing you to see the terrain under the water making easier to locate structures and other areas where fish may hide. The device converts the information and shows it on an LCD/LED screen. This way, fishermen can identify suitable targets and place bait in the optimal areas. A fish finder transmits an electric signal which is then converted into a sound wave by a hydrophone or transducer located on the underside of the boat. The sound wave is then sent into the water. If it hits something, the signal is reflected back and is displayed on the screen along with its composition, size, and shape. The power of the signal determines the details you get on the screen. In the same way, as the signal amplifies and is sent back, its distance is graphically represented which shows how far it bounced back. This will indicate the range helping you determine how far away the fish are. A fish finder is used to increase the odds of catching fish. As the fisher helps you “see” underwater, you will get a good idea of the terrain and fish. A fish finder is effective as long as you know how you translate the information displayed on the screen. That’s why as a fisherman you should have an idea of how the water landscape looks like. Portable fish finders cost significantly less than fixed fish finders. They are useful for fishermen who fish from the shore, rent boats, or go ice fishing. Portable fish finders are quick and effortless to mount and move around. They come with multipurpose transducers which can easily be installed on the hull of a kayak, boat, or canoe. Portable fish finders are also almost always cheaper than fixed fish finders although they do not typically have as many features and are not as sensitive. The fact that they are portable means no drilling to install the transducer has to be done on your boat as well. A transducer is the sonar part of the fish finder and it is responsible for sending the sound wave into the water and receiving it once it bounces back. Your fish finder will not perform without one. A good transducer will be able to translate the signals it receives from the waves it puts out. That’s why the bigger the sensor, the better it is. Most of the fish finders you find come with a transducer. Transducers are identified using their mounting style. As the name suggests, this type of transducer is mountable on the boat’s transom. They are completely submerged underwater and stick slightly below the hull. These types of transducers are usually made of plastic and are great for planing hulls that are less than 27ft. These include such boats as powerboats with outboard, jet drives, inboard-outboard, and personal watercraft. These transducers work efficiently only when the boat is not moving quickly through the water. These are glued or epoxied directly on the inside of the hull. These transducers can only be of use with fiberglass hulls. They will not work with steel, wood, aluminum, or in sandwich/foam hulls that have air pockets. Air pockets disrupt sonar signals. These transducers give good readings even when the boat is at high speed. You don't need to drill holes in the hull. Hence they do not receive any obtrusions in the water. You should be careful where you install this kind of transducer as some fiberglass hulls have reinforcements that are poor conductors of sound. These transducers are installed by drilling a hole in the bottom of the boat. They protrude into the water, thus giving the best readings. Through-hull transducers work well with boats that have straight-shaft inboard engines and displacement hulls. They must be positioned directly in front of things that may bring turbulence like the propeller or rudder. They also need a fairing block to ensure proper alignment. Traditional sonar systems transmit a pulse of energy at a particular frequency that is sent into the water column. The sound wave “listens” for echoes which it returns to create information about what is under the water. The frequency determines the details; at high frequencies, say 200 kHz, give more detail but cannot penetrate as deep. That’s why they combine different frequencies to provide detailed views. CHIRP Sonar, on the other hand, is what the military uses and has only been available for recreational use in recent years. CHIRP Sonar transmits a range of frequencies which are longer thus they transmit more energy which reaches deeper into the water. A CHIRP Sonar pulse starts on the transducer as a low vibration frequency which modulates upward to a higher frequency over the duration of that pulse. It transmits ascending pulses which can be ten times the duration of the traditional sonar. CHIRP devices have advanced digital processing known as pulse compression. They can receive and process more information for each pulse than could ever be achieved on traditional sonar. CHIRP Sonar has significantly improved bottom tracking at high speeds and deeper depth. They resolve individual targets which result in improvement in the image you see. These are the two main types of sonar systems used in fish finders. Side imaging broadcasts an angled signal (fan-like) from the sides of the boat while down imaging transmits signals directly down underneath the boat. Down imaging allows the fisherman to see more details like a shoal of fish or an individual fish. It is also more accurate in water that is 40ft or deeper. This means it will not be great in shallow water as it can have reflections that lead to a blur in the readings. It is also easy to miss any activity that is happening at the side of the boat. Side imaging allows the scanning of vast amounts of water. They do not require the boat to go directly over the area of interest. Side imaging provides more detail in a single pass and allows scanning of undisturbed areas. It is great for trolling fishermen as you’ll be able to see shoals of fish as you pass them. Lowrance is known for the little green box that they invented in 1957 as their first sonar system. They main goal is to help anglers find more fish with the help of their electronic devices. Today, they provide CHIRP Sonar devices which offer reliable underwater imaging. Their fish finders have inbuilt GPS and compass maps to assist with navigation. Lawrence redefines marine electronics as their systems are upgraded to feature SideScan and DownScan Imaging, Structure Scanning, picture-like views, Broadband sonar, and many others. The Humminbird brand has managed to put out the some of the best selling fish finders. They are the leading innovators of side imaging to provide professional and recreational anglers an edge in their fishing. The brand introduced depth sounders, marine GPS systems, and marine radios all alongside fish finders. By combining consumer insights and cutting-edge technology, this brand is a favorite among anglers all around the world. Raymarine is another world leader in marine electronics. Their products are engineered to deliver the best visual navigation. Their history spans over 80 years with fish finders that cover inshore, offshore coast fishing, and freshwater fishing. They have both DownVision and SideVision sonar modules for producing accurate structure representations and fish. Garmin is a trusted brand in the fish finder industry. They produce state-of-the-art CHIRP fish finders with GPS systems. Their products are aimed at allowing you to make the most of your time while out on the water pursuing your passion. Garmin has produced high-definition fish finders with industry-leading sonar systems and mapping software. Your fishing experience should never be frustrating when you have a reliable fish finder like the Garmin Strike 4. This is a portable model that you don’t have to install permanently on the boat; which makes it great if you rent your boat or don’t want to leave your fish finder on your boat. Installation is also very simple with no holes needing to be drilled or power cables run. The Striker 4 will come with a Garmin CHIRP Transducer. Instead of just sending one or two frequency waves, the transducer transmits a sweeping wave of frequencies which a range from low to high. These frequencies are translated individually giving a wide range of information. It creates excellent fish separation as well as crisper fish and structure images. You’ll be able to see where the big fish are located, through the crystal-clear fish detail and structural separation. Using a built-in GPS, you’ll be able to mark your favorite routes and find your way on open waters. It helps you to maintain your location anywhere on the lake. You can quickly know where fish go to feed so in future you’ll be aware of their position instead of going from place to place trying to find them. It creates a path on the screen which is easy to follow. In the same way, you can mark docks, hot spots, and boat ramps. The Garmin Strike 4 provides uninterrupted imagery, smooth scaling graphics, and rewind option for marked waypoints. It is an incredible deal if you are looking for a reasonable, feature packed and portable fish finder. The Helix 5 is a powerful unit which provides down and side-imaging viewing combinations. It comes with a 5-inch screen with a landscape orientation offering a full viewing area. It features a color display with backlight, DualBeam PLUS Sonar, precision internal GPS Chartplotting, built-in UniMap cartography, and a micro SD card slot where you can store optional maps or save waypoints. The Helix 5 uses DualBeam PLUS Sonar where it gives a narrow 20-degree focused beam surrounded by a second 60-degree beam. It expands your level of coverage by providing coverage that is equal to your depth. Say you are in 40ft water, the DualBeam PLUS Sonar will cover an area 40ft wide. The first beam focuses on the bottom while the other searches for fish in the vast coverage area. You can see the beams side by side or as one merged picture providing exceptional image detail. The Helix 5 is a compact unit that is affordably priced for the included features. Every picture pops with detail allowing you to see the fish structure like bars, points, and ledges. The down imaging tool comes in handy to let you see rock and brush with better clarity. With GPS chartplotting, you can start making sonar recordings from the point you start your fishing expedition. It is a tremendous marine instrument that mounts quickly fast and easy using either gimbal or in-dash mounting. The ideal fish finder helps you find fish and record their hiding places. That’s what the Garmin Striker Plus 7SV is all about. It comes with a 7-inch display with built-in GPS features. This fishfinder includes Garmin Quickdraw Contours map drawing software. It can store up to 2 million acres of content. Garmin provides CHIRP ClearVu and CHIRP SideVu scanning sonars. This system provides you with crystal clear images and photographic views of what passes beside and below your boat. Submerged objects and fish are clearly shown allowing you to gain access to areas with more fish. The inbuilt GPS system is a crucial part of this device. It allows you to know your position anywhere on the water. It also provides the ability to mark waypoints for fish hot spots, anchor points, and other locations. The GPS function also shows your speed on the screen allowing you to adjust your trolling speed with ease. Garmin Striker Plus 7SV is built for any environment. It comes with a bright display that is readable even in direct sunlight. You’ll like that it has an intuitive user interface which makes it simple to translate every feature on the screen. Your life on the water is going to get better as it shows you how deep the fish are hiding in near photographic detail. And better still, it’s in real time. The Venterior fish finder is your best companion whether on the lake, river, or sea if price is your main decision factor in choosing a fish finder. This is the cheapest fish finder you can buy. It can detect the approximate distance of fish, display water depth, sand, and rocks, and also display short and tall weeds. It can recall settings so whenever you turn on the unit, you’ll not have to input new parameters. This device comes with the transducer and a 25ft cable. The sensor transmits fairly deep making it useful for both shallow and deeper water fishing. You can combine the transducer with a side-scan adapter for even more comprehensive coverage. 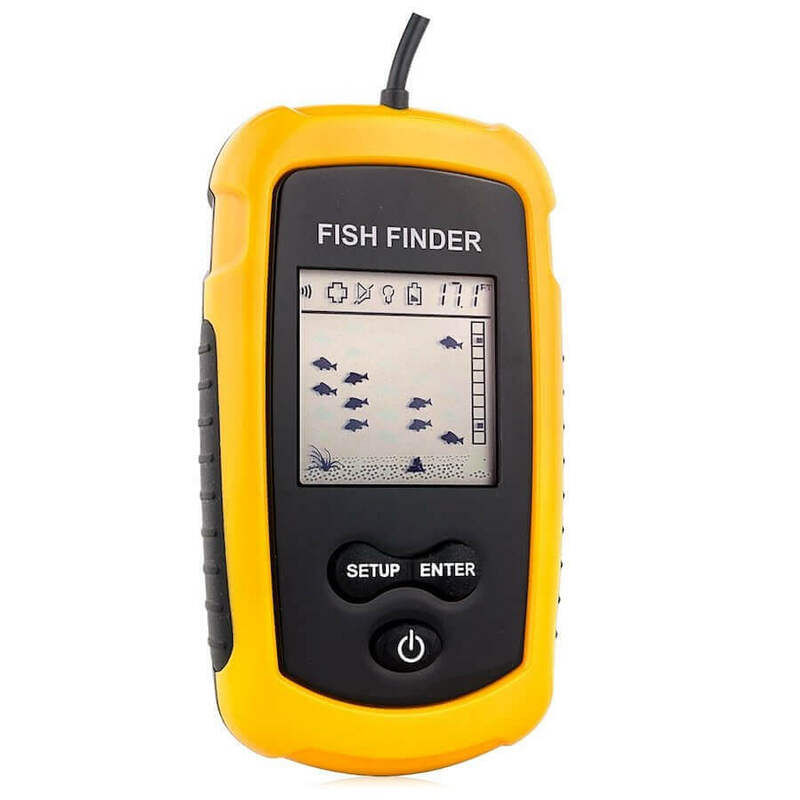 This fish finder has high sensitivity for its price point. The accuracy is decent as we;;, and you’ll find it pretty easy to read both day and night. This unit can also be used for ice fishing thanks to the wide temperature range from -40 to 1580F. If you want a cheap, portable, and easy to handle fish finder, then you better get your hands on the Venterior. The Dragonfly Pro is an innovative product with Wi-Fi and CHIRP DownVision technology. It gives you photo-like images so that you can identify fish easily. With the high-definition, all-weather color LCD, you’ll see sharp pictures at every angle even in sunlight. Dragonfly takes us to the future of Sonar. It utilizes wide spectrum CHIRP technology which transmits more signals into the water. It allows the Dragonfly to interpret and display more detail enabling you to target more fish. CHIRP DownVision technology can send signals out to 600 ft. for reliable and high-speed bottom tracking. Dragonfly Pro fish finder features built-in Wi-Fi. You’ll be able to stream Dragonfly sonar data directly to your tablet or smartphone using the Wi-Fish mobile App. The Wi-Fish app displays both DownVision technology and conical sonar. It allows you to rewind, pause, and zoom sonar data on multiple smartphones and tablets. The Deeper Sonar Pro is one of the best fish finders that uses smart sonar systems. It gives you an edge in angling thanks to its scanning depth and casting range capabilities. It connects wirelessly to your smartphone giving you every detail of your fishing area. You just need to cast this finder, reel in and create maps with remarkable details on your smartphone screen. This finder can be cast out to 300 ft. and it can scan up to 260ft. It uses dual-beam technology to transmit 15 scans per second. You can trust what you see meaning you can determine where to target fish. This is an all-season finder. It is designed to handle the heat of summer as well as the freezing conditions of winter. It can also work efficiently on fresh water and in salt water. The value is incredible on the Deeper Smart Sonar PRO. It guarantees a reliable connection in all weather conditions. Even the best fishing gear needs support for a memorable fishing experience. The fish finders on this list represent the top-performing models in the various categories. Whether you want a fish finder for ice fishing or are looking for the least expensive one, we’ve got you covered with these great models.